Tray Stands Enable Convenient Tableside Food Service In Casual Diners And Cafes Or Upscale Restaurants. 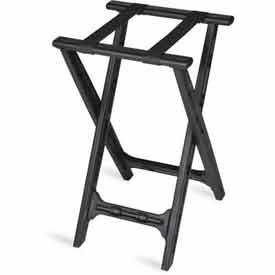 Tray Stands are made from hardwood or chrome for long lasting durability. Tray stands fold for compact storage and convenient transport from table to table. Wide stable base supports heavy trays. Color finishes are Black, Brown, Chrome, Dark Wood, Light Wood, Mahogany and Walnut. Heights are 30", 30.5", 31", 36" and 38" with widths of 18.5", 19" and 20". Food service trays are sold in Packages of 1, 4, 5 or 6 for convenience. Room Service Tables And Carriers Are Used For Efficient And Elegant Presentation Of Room Service Meals. 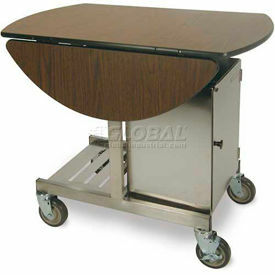 Room Service Tables feature a scratch and burn resistant laminate top over plywood for long lasting durability. Full-length piano hinged leaves provide added strength. Available styles include Fold-Up, Food Carrier Box Storage Rack, Hot Box Transport Rack, Room Service Hot Box, Room Service Tables, Standard Room Service Table, Tri-Fold Leaf Room Service Cart and more. Tables fold easily to save valuable storage space. Choose from Fuel Canister or Electrical heat sources. Dimensions vary per style.